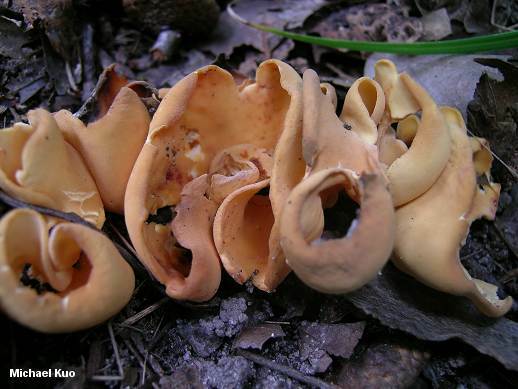 This cup fungus and its close relatives, members of the genus Otidea, are characteristically split down one side, resulting in a folded cup shape. 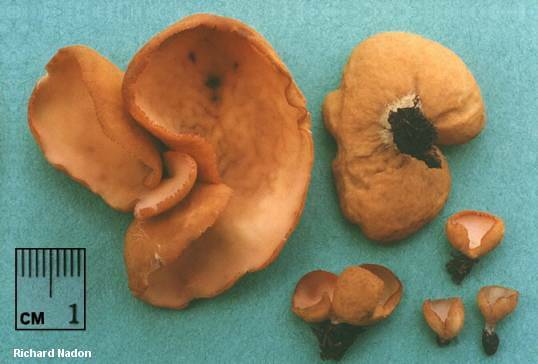 Much is made in keys to Otidea of whether the cup shape is reminiscent of an erect rabbit ear, or is more truncated and cuplike--but this "character" is difficult to assess, and microscopic examination is often required to identify species. Otidea onotica is supposed to be one of the "rabbit-ear species" rather than one of the "chopped-off, split goblet" species. More reliable characters include its brownish yellow colors, the rosy tinge on the inner surface, its clustered growth, and microscopic characters (see below). 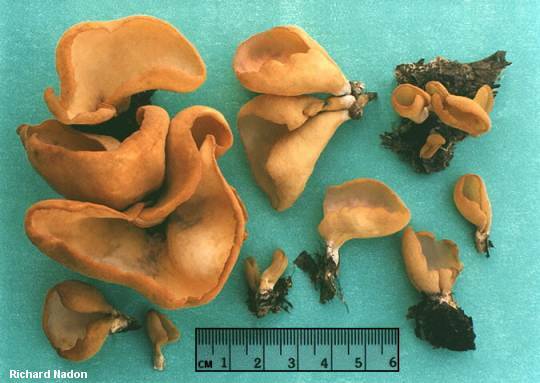 Fruiting Body: Spoon-shaped, ear-shaped, or cuplike, with a cleft down one side; up to 10 cm high and 6 cm across; inner surface yellowish to orangish, often with rose or pink areas; outer surface similarly colored but lacking pink or rose shades, often finely fuzzy; stem if present whitish, small, and rudimentary. Odor none. Flesh pale yellowish; brittle. Microscopic Features: Spores 12-14 x 6-7 µ; smooth; elliptical; with one or two oil droplets. Asci eight-spored; up to 200 x 11 µ. Paraphyses narrow, usually with hooked or curved ends (see illustration). REFERENCES: (Persoon, 1801) Fuckel, 1869. (Fries, 1822; Seaver, 1928; Kanouse, 1949; Smith, Smith & Weber, 1981; Arora, 1986; Barron, 1999.) Herb. Kuo 09110415. Kuo, M. (2006, April). Otidea onotica. Retrieved from the MushroomExpert.Com Web site: http://www.mushroomexpert.com/otidea_onotica.html.